The High Road to Taos is a scenic mountain route that wanders through old Spanish villages high in the foothills of the Sangre de Christo Mountains. From Santa Fe go north to Pojoaque, and then northeast on route 503 through Nambe, and on up state routes 76 and 75, and finally up 68 to Taos. Driving north from Nambe, pass through an area of affluent homes and then up onto dry, rocky hills dotted with juniper and pinon pine. A few miles further, you reach Chimayo ( Santuario de Chimayo), a small village (pop. 1,400) shaded by large cottonwoods. An old settlement, founded by the Spanish in 1598, Chimayo has long been known for its weavers. In the early 1800s, residents of Santa Fe asked Spain to send over skilled weavers to teach the craft to the frontier settlers. Two skilled weavers, the Ortega brothers, made the journey and settled in Chimayo where they have taught their craft for the ensuing eight generations. Chimayo has since been known for weaving and Ortega is one of the best known names in the field. Irvin Trujillo is a 7th generation Cintinela Weaver. Once you turn onto 76 start looking for Truchas and Las Trampas with their lovely mission churches. Nuestra SeÒora del Sagrado Rosario Mission Church in Truchas, New Mexico was Built about 1805. Nuestra SeÒora del Sagrado Rosario is dedicated to Our Lady of the Rosary, and contains a treasure of Santos, Bultos and other artifacts collected by generations of worshipers. 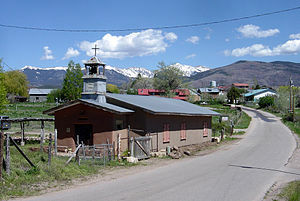 Truchas is a strikingly beautiful little village (pop 1,000) that sits on the edge of a canyon high up in the Sangre de Christo Mountains at 8,400 feet. Settled in 1754, the community prospered almost immediately. It is home today to many artists, weavers and wood carvers. The San Jose de Gracia Mission Church in Las Trampas, New Mexico was completed about 1776, San Jose de Gracia has been called “the most perfectly preserved church in the United States.” First settled in 1751 by 12 Spanish families from Santa Fe, Las Trampas flourished despite Comanche and Apache raids. The village, a Spanish-American agricultural community, preserves significant elements of its 18th-century heritage in appearance and culture. The Las Trampas area is a National Historic Landmark. Keep following the signs for Taos and you will finally arrive in Rancho de Taos with its world famous mission church.